A scientist strives to understand the work of Nature. But with our insufficient talents as scientists, we do not hit upon the truth all at once. We must content ourselves with tracking it down, enveloped in considerable darkness, which leads us to make new mistakes and errors. 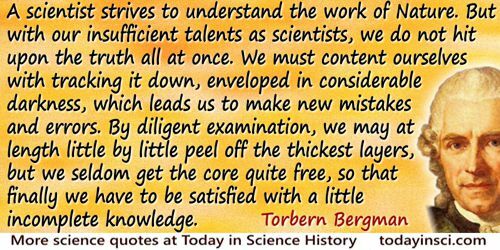 By diligent examination, we may at length little by little peel off the thickest layers, but we seldom get the core quite free, so that finally we have to be satisfied with a little incomplete knowledge. Lecture to the Royal Swedish Academy of Science, 23 May 1764. Quoted in J. A. Schufle 'Torbern Bergman, Earth Scientist', Chymia, 1967, 12, 78. An evolutionary perspective of our place in the history of the earth reminds us that Homo sapiens sapiens has occupied the planet for the tiniest fraction of that planet's four and a half thousand million years of existence. In many ways we are a biological accident, the product of countless propitious circumstances. As we peer back through the fossil record, through layer upon layer of long-extinct species, many of which thrived far longer than the human species is ever likely to do, we are reminded of our mortality as a species. There is no law that declares the human animal to be different, as seen in this broad biological perspective, from any other animal. There is no law that declares the human species to be immortal. Co-author with American science writer Roger Amos Lewin (1946), Origins: What New Discoveries Reveal about the Emergence of our Species and its Possible Future (1977), 256. And now, as a germination of planetary dimensions, comes the thinking layer which over its full extent develops and intertwines its fibres, not to confuse and neutralise them but to reinforce them in the living unity of a single tissue. In Teilhard de Chardin and Bernard Wall (trans. ), The Phenomenon of Man (1959, 2008), 244. Originally published in French as Le Phénomene Humain (1955). At the planet’s very heart lies a solid rocky core, at least five times larger than Earth, seething with the appalling heat generated by the inexorable contraction of the stupendous mass of material pressing down to its centre. For more than four billion years Jupiter’s immense gravitational power has been squeezing the planet slowly, relentlessly, steadily, converting gravitational energy into heat, raising the temperature of that rocky core to thirty thousand degrees, spawning the heat flow that warms the planet from within. That hot, rocky core is the original protoplanet seed from the solar system’s primeval time, the nucleus around which those awesome layers of hydrogen and helium and ammonia, methane, sulphur compounds and water have wrapped themselves. By looking at the sun at different wavelengths, we can peel off the different layers in the (solar) atmosphere, just like peeling an onion. Primary Source needed. Can you help? Mr. Chairman, ladies and gentlemen, I am told that someone accused me of saying that if the Ministry of Fuel and Power were boring for coal and they went through a layer of gold nine feet thick they would throw it away because they wouldn't know what to do with it, Sir, I only said four feet thick. Remark while accepting a presentation upon his retirement from I.C.I. As quoted by Peter Allen in obituary, Biographical Memoirs of Fellows of the Royal Society (Nov 1976), 22, 117. From Interview in BBC TV program Horizon (1981). As quoted in The Pleasure of Finding Things Out: The Best Short Works of Richard P. Feynman 1983, (1999), 23. Quoted in Ernst Heinrich Philipp August Haeckel, The Evolution of Man (1897), Vol 1, 185. The first attribute that characterizes the greater man from the moron is his thicker layer of inhibition." The scientific tradition is distinguished from the pre-scientific tradition by having two layers. Like the latter, it passes on its theories; but it also passes on a critical attitude towards them. Conjectures and Refutations: the Growth of Scientific Knowledge (2002), 66. We are peeling an onion layer by layer, each layer uncovering in a sense another universe, unexpected, complicated, and— as we understand more—strangely beautiful. With co-author A. H. Rosenfeld in 'An Explanatory Statement on Elementary Particle Physics,' American Scientist, June 1960. [We are] a fragile species, still new to the earth, … here only a few moments as evolutionary time is measured, … in real danger at the moment of leaving behind only a thin layer of of our fossils, radioactive at that. The Fragile Species (1992, 1996), 25.